This picture shows a lab demonstration of the measurement chamber inside the Tunable Laser Spectrometer, an instrument that is part of the Sample Analysis at Mars investigation on NASA's Curiosity rover. 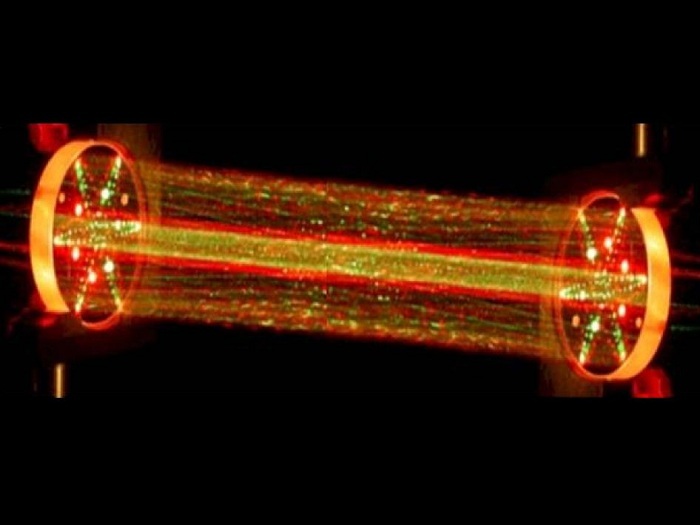 This demonstration uses visible lasers – rather than the infrared ones on the actual spectrometer – to show how the lasers bounce between the mirrors in the measurement chamber. The TLS shoots laser beams into a type of measurement chamber that can be filled with Mars air. By measuring the absorption of light at specific wavelengths, the tool can measure concentrations of methane, carbon dioxide and water vapor in the Martian atmosphere and different isotopes of those gases. PASADENA, Calif. -- NASA's car-sized rover, Curiosity, has taken significant steps toward understanding how Mars may have lost much of its original atmosphere. Learning what happened to the Martian atmosphere will help scientists assess whether the planet ever was habitable. The present atmosphere of Mars is 100 times thinner than Earth's. A set of instruments aboard the rover has ingested and analyzed samples of the atmosphere collected near the "Rocknest" site in Gale Crater where the rover is stopped for research. Findings from the Sample Analysis at Mars (SAM) instruments suggest that loss of a fraction of the atmosphere, resulting from a physical process favoring retention of heavier isotopes of certain elements, has been a significant factor in the evolution of the planet. Isotopes are variants of the same element with different atomic weights. Initial SAM results show an increase of five percent in heavier isotopes of carbon in the atmospheric carbon dioxide compared to estimates of the isotopic ratios present when Mars formed. These enriched ratios of heavier isotopes to lighter ones suggest the top of the atmosphere may have been lost to interplanetary space. Losses at the top of the atmosphere would deplete lighter isotopes. Isotopes of argon also show enrichment of the heavy isotope, matching previous estimates of atmosphere composition derived from studies of Martian meteorites on Earth. Scientists theorize that in Mars' distant past its environment may have been quite different, with persistent water and a thicker atmosphere. NASA's Mars Atmosphere and Volatile Evolution, or MAVEN, mission will investigate possible losses from the upper atmosphere when it arrives at Mars in 2014. With these initial sniffs of Martian atmosphere, SAM also made the most sensitive measurements ever to search for methane gas on Mars. Preliminary results reveal little to no methane. Methane is of interest as a simple precursor chemical for life. On Earth, it can be produced by either biological or non-biological processes. Methane has been difficult to detect from Earth or the current generation of Mars orbiters because the gas exists on Mars only in traces, if at all. The Tunable Laser Spectrometer (TLS) in SAM provides the first search conducted within the Martian atmosphere for this molecule. The initial SAM measurements place an upper limit of just a few parts methane per billion parts of Martian atmosphere, by volume, with enough uncertainty that the amount could be zero. "Methane is clearly not an abundant gas at the Gale Crater site, if it is there at all. At this point in the mission we're just excited to be searching for it," said SAM TLS lead Chris Webster of NASA's Jet Propulsion Laboratory in Pasadena, Calif. "While we determine upper limits on low values, atmospheric variability in the Martian atmosphere could yet hold surprises for us." In Curiosity's first three months on Mars, SAM has analyzed atmosphere samples with two laboratory methods. One is a mass spectrometer investigating the full range of atmospheric gases. The other, TLS, has focused on carbon dioxide and methane. During its two-year prime mission, the rover also will use an instrument called a gas chromatograph that separates and identifies gases. The instrument also will analyze samples of soil and rock, as well as more atmosphere samples. 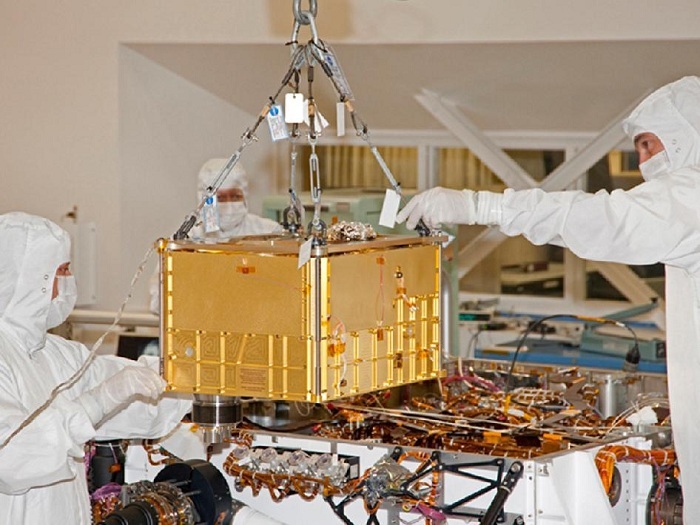 "With these first atmospheric measurements we already can see the power of having a complex chemical laboratory like SAM on the surface of Mars," said SAM Principal Investigator Paul Mahaffy of NASA's Goddard Space Flight Center in Greenbelt, Md. "Both atmospheric and solid sample analyses are crucial for understanding Mars' habitability." SAM is set to analyze its first solid sample in the coming weeks, beginning the search for organic compounds in the rocks and soils of Gale Crater. Analyzing water-bearing minerals and searching for and analyzing carbonates are high priorities for upcoming SAM solid sample analyses. Researchers are using Curiosity's 10 instruments to investigate whether areas in Gale Crater ever offered environmental conditions favorable for microbial life. JPL, a division of the California Institute of Technology in Pasadena, manages the project for NASA's Science Mission Directorate, Washington, and built Curiosity. The SAM instrument was developed at Goddard with instrument contributions from Goddard, JPL and the University of Paris in France. This graph shows the percentage abundance of five gases in the atmosphere of Mars, as measured by the Quadrupole Mass Spectrometer instrument of the Sample Analysis at Mars instrument suite on NASA's Mars rover in October 2012. The season was early spring in Mars' southern hemisphere, and the location was inside Mars' Gale Crater, at 4.49 degrees south latitude, 137.42 degrees east longitude. 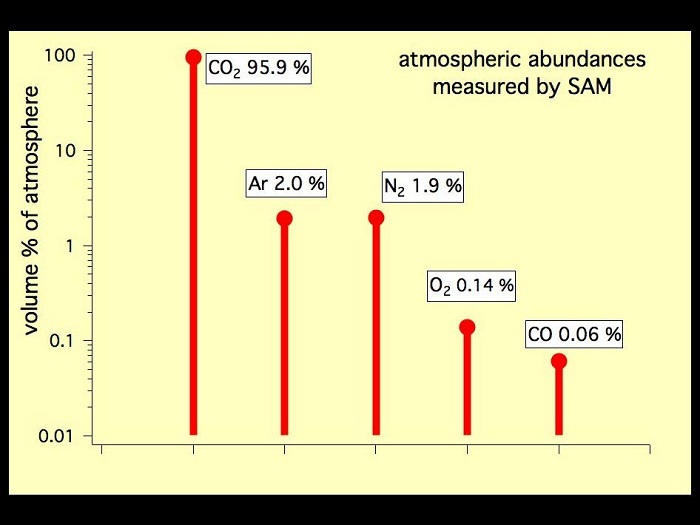 The graph uses as logarithmic scale for volume percentage of the atmosphere so that these gases with very different concentrations can all be plotted. By far the predominant gas is carbon dioxide, making up 95.9 percent of the atmosphere's volume. The next four most abundant gases are argon, nitrogen, oxygen and carbon monoxide. Researchers will use SAM repeatedly throughout Curiosity's mission on Mars to check for seasonal changes in atmospheric composition. The Sample Analysis at Mars (SAM) instrument, largest of the 10 science instruments for NASA's Mars Science Laboratory mission, will examine samples of Martian rocks, soil and atmosphere for information about chemicals that are important to life and other chemical indicators about past and present environments. NASA's Goddard Space Flight Center, Greenbelt, Md., built SAM. The 40-kilogram (88-pound) instrument includes three laboratory tools for analyzing chemistry, plus mechanisms for handling and processing samples. In this photograph, technicians and engineers inside a clean room at NASA's Jet Propulsion Laboratory, Pasadena, Calif., prepare to install SAM into the mission's Mars rover, Curiosity. The photograph was taken on Jan. 6, 2011. The analytical tools in SAM are a mass spectrometer built by NASA Goddard, a gas chromatograph built by French partners supported by France's national space agency in Paris, and a laser spectrometer built by JPL. SAM's sample manipulation system, including 74 sample cups for carrying powdered samples to two ovens, was built by Honeybee Robotics, New York. Curiosity's robotic arm will deliver powdered samples, drilled from rocks or scooped from soil, to SAM's inlet tubes on top of the rover deck. Ovens will heat most samples to about 1,000 degrees Celsius (about 1,800 degrees Fahrenheit). SAM will take in atmospheric samples through separate ports on the side of the rover. Inside SAM are more than 600 meters (more than 650 yards) of wiring, 52 microvalves, a saft-drink-can-size pump that rotates 100,000 times per minute, and many other components. NASA will launch Curiosity from Florida between Nov. 25 and Dec. 18, 2011, together with other parts of the Mars Science Laboratory spacecraft for delivering the rover to the surface of Mars in August, 2012. During a prime mission lasting one Mars year (two Earth years), researchers will use the rover in one of the most intriguing areas of Mars to investigate whether conditions there have been favorable for microbial life and favorable for preserving evidence about whether life has existed.